I choose to reflect on toad in the hole because it was our first lab of the year and our first group activity. I enjoy the lab because I got to meet new people in our group and that we talk about what is good and bad about being in Foods and Nutrition 10,but it was all good comments though :). I enjoyed the lab because we made our toad in the hole like it was suppose to and tasted good with bread and tea!! 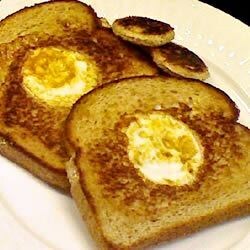 our product did look and taste what it was supposed to, but the egg was a little salty because we added a little salt to it and the bread was a little damp because we didn’t cook the bread thoroughly. Our group worked well together for our first lab ever. one of our group mate was a little miss-behaving but it was ok until he saw that we made our food looked good and all. there wasn’t much issue because everybody was expecting our food for the first time and we were a little hungry to be honest. and that is all I’m going to write.